↑ "Titanian" is the adjectival form of both Titan and Uranus's moon Titania. However, whereas the latter may be pronounced with an ah vowel (/tɨˈtɑːnjən/), the form for Titan is only pronounced with an ay vowel: /taɪˈteɪniən/. 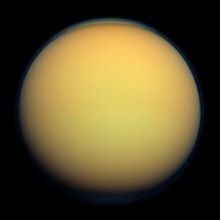 The less common "Titanean" /taɪtəˈniːən/ refers only to Titan.